Once again, the genealogists beat out the lawyers. In that niche category, the winner and still champion for the second year in a row — The Legal Genealogist. This tale began back in November 2013 when I got an email with a return address of americanbar.org — and I almost deleted it. I figured it was a pitch for membership in the ABA and, since I’m not in active law practice any more, and don’t have an active law license, I had my finger on the delete key when I realized it was about something else altogether. Then I found out about the fan voting part — the fact that voters in each category could choose a blog for the top honors. It was only because you, dear readers, turned out in force that I was saved from the ignominy of losing out to a blog about wills and trusts. Talk about a sigh of relief… I mean really! If a blog about dead people is gonna win, it should be about dead people and their family history, right? Then in November 2014 in came the email from the American Bar Association Journal for 2014. A second nomination. That’s definitely cool. And you can imagine my joy when I saw that there was a new category for law professors and that the guy who gave me such a run for the money last year was moved to that new category. I figured 2014 would be a snap. Now really. I wouldn’t have minded losing to the winner in the Criminal Justice category — a blog I hope many genealogists voted for — Defrosting Cold Cases by cold-case consultant Alice de Sturler. Or to the winner in the Legal Research / Legal Writing category — my own favorite law blog and one I know many genealogists supported — In Custodia Legis, the blog of the Law Library of Congress. But I did not want to lose to a blog about agriculture law. As a matter of fact, The Legal Genealogist was the second highest vote-getter of all 100 nominees in all categories, across the board, second only to Top Class Actions, a blog about class action lawsuits. That blog is described as a kind of searchable database of class action filings and settlements produced by a staff of news writers. I’m one genealogist with a law degree. And you — you, dear readers — you still almost outvoted those guys!! Thanks so much! And it was you, the reader, who did it too! I voted for you both years. Congrats! Congratulations! 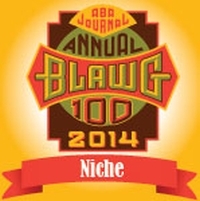 While the class actions BLOG (not – ew – “blawg”) might have garnered the most votes, I am happy to be of the class of individuals that supported The Legal Genealogist. Now on to the three-peat (a word that is far less egregious than “blawg”)! I think I might have minded losing to the wills and trusts blog worse! I mean, after all, losing to a blog about dead people? Really??? So well deserved, Judy! I look forward to your witty, charming and so informative blogs every day. We are so lucky to have you in our camp. Congrats. Enjoy the site and all the work put in to it. Aw… thanks Dee Dee, and I’m glad your professor is now in a different category (and won his category!). Somewhere in time there are Cottrell and Baker women saying “Thata girl Judy, you make us proud”. Horseshoes, pitchin washers or BLAWGS, the competitive spirit of those families shine thru. We are indeed competitive, aren’t we??? Judy, you’re a class act even when you’re bragging – er, thanking us – for helping you win! Congratulations for a great win once again. Ballot-stuffing is such a fine art. Thanks so much, Celia — this win really goes to the readers!! Oh, Judy! You may have received the honors, but the real winners are those of us who get to enjoy the daily dose of wit and wisdom that is The Legal Genealogist. And for that, we should be thanking you. Oh, thanks so much — that’s so nice for you to say, Jerry! Congratulations Judy. From Oz. Whilst not all your posts are relevant in Australia with our quite different legal system and history, the concepts are. And you are SO energetic. Greatly to be admired. Thanks so much for the kind words! And as a resident of one common law nation to the resident of another common law nation, our legal systems are really not so different under the skin. To echo Judy’s comments, in some ways Australian law is more akin to American law, in that Australia’s constitution is much more heavily modeled on the US constitution, while the Fathers of Confederation in Canada eschewed the American model and did their best to avoid echoing its US counterpart. (Thus “Peace, Order, and Good Government” rather than “Life, Liberty, and the Pursuit of Happiness”. That said, the legal situation in Canada has shifted somewhat in the last 40 years. Portions of the 1982 Charter of Rights and Freedoms bear a much stronger resemblance to US constitution, while the Supreme Court of Canada, and to a lesser degree the provincial appellate courts, is more likely to consider US jurisprudence than it had been in the past. Thanks for adding that, Sean! Congrats. Added to your bio. Thanks so much, John! Much appreciated!